The present water supply for Cottonwood Falls consists of three wells. The well water is treated in a water treatment plant which was constructed in 1985. The wells have a capacity of 160-250 gpm and the treatment plant has a design rate of 300 gpm. The area served by the City of Cottonwood Falls water supply and treatment plant consists of the area within the city limits and immediate vicinity. The population within the City is 940 persons with approximately 502 customer accounts. The City recently finished Phase I of a Two Phase water delivery system improvement project that began in February of 2014. 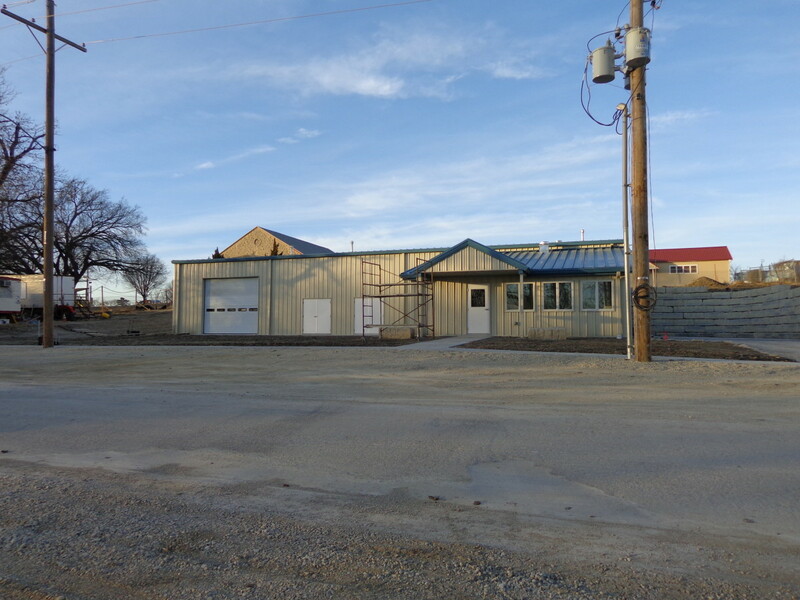 Major upgrades to water mains and infrastructure serving downtown, as well as a corridor throughout the residential area of the town have been completed. 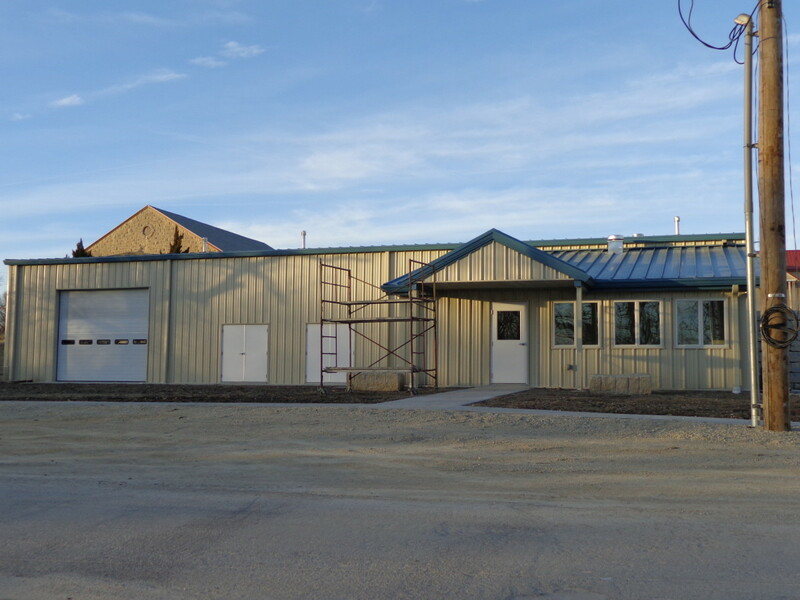 Construction has began on a new water treatment plant through the newly established Public Wholesale Water Service District #26. The PWWSD #26 will service the cities of Cottonwood Falls, Strong City and the Rural Water District. Billing information and copies of the Emergency Water Plan and Municipal Water Conservation Plan are on file at the City Clerk’s Office. To View the 2015 CCR Report, please click the link below! 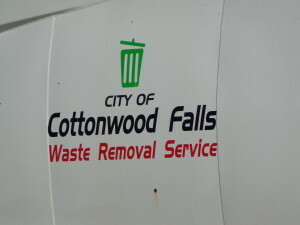 The City of Cottonwood Falls maintains a municipally owned Solid Waste Service providing mechanized polycart and commercial dumpster service for the collection, transport and disposal of solid waste generated by the residential and commercial solid waste customers of the City of Cottonwood Falls and the City of Strong City. 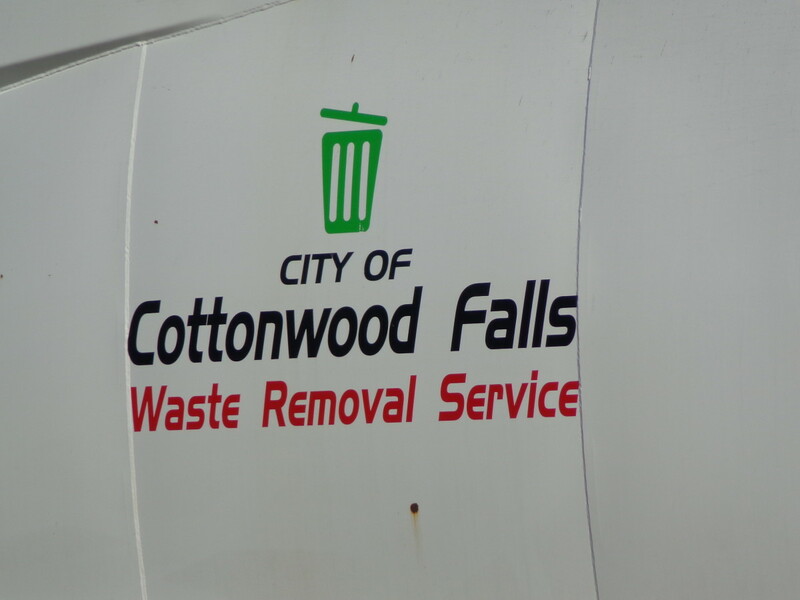 The City provides weekly (Thursday) solid waste service to 3– Residential customers and customized weekly solid waste service to 1–Commercial customers living in Cottonwood Falls. 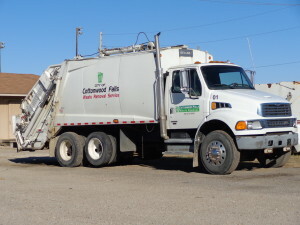 The City provides weekly (Tuesday) Solid Waste Service to 2– Residential customers and customized weekly solid waste service to 1– Commercial customers living in Strong City. See Ordinance No. 954 for current fees and regulations.